Michael’s article about Ro Laren really got me thinking about how Voyager could have been a lot more exciting. Don’t get me wrong, it is still my favourite series! I am a die hard Voyager fan, but reading Michael’s ‘What if Ro Laren had been Voyager’s First Officer?’ got my mind whirling with scenarios, questions and what if’s. First of all as to what I think of there not being the whole ‘ Wouldn’t they/won’t they’ with Janeway and Chakotay, I am a J/C fan, I was rooting for them from the beginning but it was never going to happen. However if Ro was first officer there would have been a more interesting relationship filled with mistrust and could have had us gripped! I agree with Michael that both women would have been so strong willed and would have definitely ‘butted heads’! However if it were to be that way I think the writers would’ve had to find a way of not having that as the soul storyline, they could get carried away (the Kazon). To have Ro Laren as First Officer instead of Chakotay would have made Voyager a more exciting and dangerous series. We would have seen lots of attempted mutiny episodes where Janeway’s authority would have been tested and the question of who would get them home and how, would come up! Ro definitely wouldn’t have been so quick to fall into serving under Kathryn Janeway. She would’ve fought to take the Captain’s place and get the crew’s home by any means necessary, or would she?! 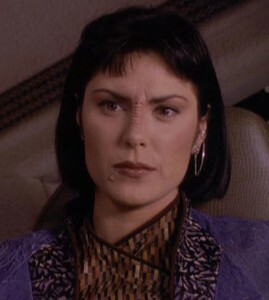 If Ro Laren was on that Maquis ship Voyager was sent to bring back, ‘Caretaker’ would’ve been full of uncertainties. What would she do after she got her crew member back? Would she have insisted on taking over? If she did take the First officer position would we have felt that she was being genuine in that decision or would it pose more questions about what the fate of the crews would be? That would’ve kept us on tender hooks wouldn’t it? After ‘Caretaker’ she may have waited for the right moments to relieve Janeway from command and then stage a full blown mutiny, in episodes where Janeway was injured or incapacitated, we could have seen Ro try to take over. How would Janeway react to that? 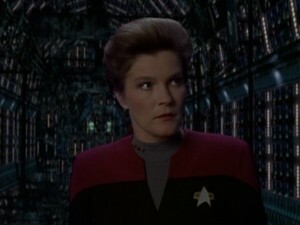 Could we have seen that darker side of Janeway that we thought could have quite easily seen in later seasons? It would have explores both characters further. ‘Scorpion’ as Michael said is an excellent example of how Ro could have completely changed that episode. I agree with Michael that Ro would have gone along with the plan until Janeway is injured then that could have been an opportunity for Ro to take over and do whatever it took to survive though I don’t think 7 of 9 would be there at all, Ro wouldn’t have just ‘dealt with Seven better’ she would’ve continued to try and throw her out the airlock until she succeeded. This makes me think about how much further the writers could have gone as far as danger for Voyager in the ‘Delta Quadrant’, if reckless behaviour could have either got them home earlier or killed. This links to ‘Equinox’, Michael touched upon this, if Ro was first officer this could have been the opportunity she needed to take command! Seeing how the ‘Equinox’ crew fought their way through the ‘Delta Quadrant’ would have given Ro that chance to take over and get Voyager home without thinking about ‘Starfleet regulations’, but at what cost? I definitely think that Ro wouldn’t have stopped Janeway from torturing Lessing, might she have even let her go that step further? That indeed would have ‘opened the door to some great story telling’ This got me thinking if that had happened, would Janeway have to step down because of the guilt of it building up? What would Janeway become if this happened, if she didn’t have Chakotay as her ‘rock’ would she break? So would it have been a good thing? I think it would have been great, if executed properly. It would have been annoying if it was a continuous conflict all the time, if they wrote it so Ro would have waited for those moments where Janeway was at her weakest then it would have made for a very exciting plot! Reprinted with kind permission from Laura Fawcett. What if Ro Laren had been Voyager’s First Officer? 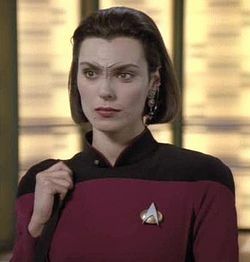 Unless you have been leaving on Ceti-Alpha V you would know that I have always liked the character of Ro Laren and the actress Michelle Forbes. From the moment Ro beamed aboard the Enterprise D in the episode “Ensign Ro” I knew this character was going to be special. From butting heads with Riker to putting Picard in his place by correcting him on how she should be properly addressed you knew that Ro was going to bring some much needed conflict to TNG. For those who don’t know about Ro Laren, here is a brief character overview. Ro came aboard the Enterprise after being court-martialled after an incident on Garon II where after disobeying orders eight crew members are killed. An Admiral needs Ro to help Picard stop Bajoran terrorist attacks against the Cardassians and to stop the Federation being dragged into the conflict. Of course there is more to this than meets the eye but with help from Guinan & Picard, Ro does the right thing and the crisis is averted. Picard likes Ro (something that for me I found very special throughout the time on TNG) and sees something in her that he convinces her to stay aboard the Enterprise and begin again. “Ensign Ro” apart from introducing a new character to TNG also began the story that would be Deep Space Nine. The Bajoran people were created, we found out that the Cardassians had occupied Bajor for over four decades, that the planet had once had a rich culture and were deeply spiritual. These were the first seeds of that new story. 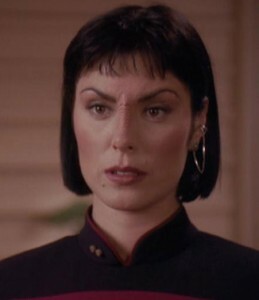 When it came time to create the show the writers wanted Michelle Forbes to join the cast as Ro Laren who would become the first officer on the station and would engender interpersonal conflicts with Ben Sisko. Michelle declined the offer to instead focus on her film career. I have to say the possibilities would have been amazing with Ro as the first officer on DS9. We would have seen a different relationship with Sisko that Kira had, while Kira was already deeply religious it would have been nice to see Ro rediscover her beliefs. Also interacting with the rest of the crew would have had different results. Would we have had the Ro / Odo relationship? How would Ro have gotten on with Worf when he joined the crew? Questions we may never know, but it’s nice to say “what if”…. Now I heard something that I am trying to collaborate that Michelle Forbes also turned down the chance of playing Ro Laren on Voyager. How cool would that have been? This got me thinking what if Ro Laren had been Voyager’s First Officer? Where do we begin? Well I would say that it was Ro on the ship that was being chased by Voyager; she was leader of the Maquis cell that Tuvok had infiltrated. We know from Ro’s last appearance on TNG that she had betrayed the Federation and no doubt would have risen in the ranks of the Maquis due to her experience in Starfleet and tactical training. 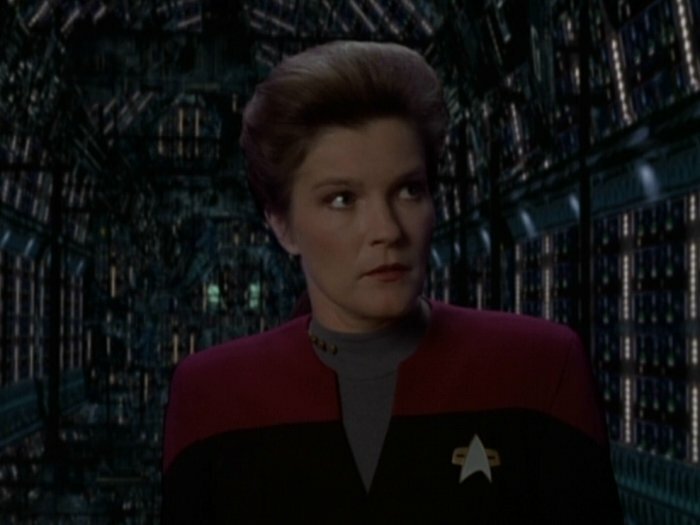 I think from the very beginning Ro would have been more suspicious of Janeway, her motives after being captured by the Caretaker of the two crews joining together. We all agreed that Chakotay fell into place too quickly. I don’t think we would have seen that, we might have seen more conflict between the two crews since Ro would not have been on board with the two crews joining to begin with. What I want to do is to look at the one relationship that would have been different with Ro aboard Voyager and mention a couple of episodes that stand out for me where there might have been different outcomes or at least some changes that could have improved the story. Captain Janeway – Now we would never have had all the “would they / won’t they” with Chakotay if Ro had been First Officer. I think that these two would have “butted heads” a lot more than since they are both strong willed characters. As we saw in “Disaster” from TNG when Troi was in command Ro was not afraid to make the big decisions to save the ship, she would have separated the saucer section and allow the rest to die (she did think they were already dead) given the chance. I think Ro would have supported Janeway but she would question things more: “how does this help us get home, what impact would this have upon the crew”? We often saw Chakotay just fall into line on too many occasions. I would love to have seen the relationship between the two build over the course of the journey. While Picard earned Ro’s trust very quickly I think it would have been much harder for Janeway but once it was there I think it would have been stronger than that of Chakotay & Janeway. What also would have been good for Voyager was that both lead characters were female. No Star Trek show had attempted that. Of course there would have been complaints of too many women on the show but you could have easily made Torres into a man. Tom Paris could have had a relationship with Ro which could have gone on the same lines as the ones B’Elanna had with Tom over the years. Instead of having B’Elanna exploring her Klingon heritage we would have seen Ro explore her Bajoran beliefs. Although Ro was not as angry as Torres she still had a lot of “baggage” to deal with, her time in prison, the incident leading to her imprisonment, betraying Picard and those deep down from her childhood coping with the death of her father at the hands of the Cardassians. For me two stories that stand out are “Scorpion” from season three/four and “Equinox” from season five / six. Both of these stories highlight cracks in the chain of command. As we know in Scorpion Janeway wants to form an alliance with the Borg to allow them to travel through Borg Space and to fight Species 8472. Chakotay was against it and almost put the whole operation in jeopardy since he did not trust his Captain’s judgement. How do I think Ro would have handled things? First of all I think Ro would have gone with the plan, however, after Janeway had been injured she would have handled Seven much better. She would have planned contingencies, looked at the bigger picture of what would have happened if the alliance failed. With Ro on board with the plan, Janeway & Ro would have had time to plan ahead of taking into account any possible Borg treachery. The second is “Equinox”. As we know the Starship Equinox was also stranded in the Delta Quadrant but unlike Voyager took some questionable methods in their attempts get home. Janeway becomes obsessed with capturing the Equinox and Ransom and bringing them to justice. Here I think Ro would have relieved Janeway of command, something I think Chakotay did not seem capable of doing. I think we would have seen something like “Crimson Tide” but in the end trust would have been restored in time to capture Ransom. Although, I don’t think Ro would have stopped Janeway from torturing Lessing. Now that would have opened the door to some great story telling as they both have to cope with their actions over the course of the season. Would we have seen too many dramatic changes if Ro had come aboard Voyager? Most probably not! As we know “Reset Berman” did not like to shake things up too much, he didn’t want conflict between the main cast unless it was “all happy families” by the end but I do think we would have seen a stronger first officer, we would have seen someone who could stand up to Janeway and might just have made Picard proud of her once again…. Rounding up the last few weeks without too much rambling..
Well, I am on the train heading back to Wales after the Super London Comic Convention. I was only there for the day but it was a great experience. It was great to see my family, something I don’t do as much as I should. I have to say after leaving home some twenty years ago it is always strange to stay at my mums. Everything seems so much smaller now. Before I talk about the weekend I need to catch up on some bits from the last couple of weeks. As you know Becky’s birthday was great and then this led into a weekend of pod recording including interviews with Scott Tipton, J.K Woodward and David Alan Mack. Even as I wrote that last sentence I cannot believe that I would be interviewing famous comic writers, authors, artists. How life has changed since I started podcasting. These interviews were great. I am always very nervous before an interview, even though I have prepared pages of notes including questions, quotes from previous interviews and more (how some people can just turn up and record with no preparation is amazing. A skill I just cannot do) but after ten first ten minutes I settle down and it all comes together. The Scott & J.K interview was so funny, we had a great time recording while discussing blow up Daleks, comics and some very interesting plans for the future. David Alan Mack was incredible. We had spent three shows on Ten Forward reviewing the Destiny trilogy and to actually speak to the author was an honour. What surprised was that before we started recording David was kind enough to mention that our shows were very insightful into his novels and he had even blogged about the quality of the show. I am glad I was sitting down or I would have fallen down. Here we are to thank this author for coming on the show but he is thanking us for some great reviews! What was even better was that David repeated himself while we were recording. I won’t say anymore about the interview or Sina will put me in the agony booth again! This show is coming out very soon. Of course that leads me into the Captain’s Table from Ten Forward. This is not a new pod (I am sure we can all breathe a sigh of relief there…) but merely a supplemental show for our monthly book club. Sina and I will be interviewing those who have shaped Star Trek in words and already we have interviewed four authors with four or five more planned over the coming months. I will give you a heads up when they will be released. The first with Dayton Ward was released a couple of weeks ago. So far we have had a lot of positive feedback from the listeners. Sina and I put a lot of work into preparing these so as you can imagine we want to produce a good show and keep these quite close to the chest until we are ready to release. Valentines came and went. Becky does not like the day, like me why do you need one “extra special day” to tell someone you love them? Of course I did buy Becky some flowers but again do you need it to be a day on the calendar to send flowers? After 14 years together we have come to know what we do and don’t like. I am looking forward to getting home this evening, seems like ages since I last saw Becky (in fact it was Friday). I had some bad news with my bookkeeping. I failed the exam which means I now need to go back, revise, study harder and hopefully pass it a second time. To ensure that you have given yourself enough time to prepare there is a gap between the times you can resit the exam. Makes sense to me but is frustrating. Back to the books now that the comic con is out of the way. My fitness campaign is still going. I am now lighter than I have been for the past four years. How great is that! I continue to eat when hungry and not when bored; I have managed to cut down on all the snack food (except today on the train…). The great thing is that you can see the difference, I feel better when I am out which are all pluses. I am looking forward to getting back to my cross trainer, walks. Weight loss is not a sprint and I need to remember this. I can be quite impatient so need to ensure I don’t get disheartened by not having instant results. I tried on a couple of shirts and could not believe how big they were on me. All that brings me back to the weekend just gone. I caught up with my two brothers and one of my sisters. That was good. Being the youngest of five does mean I am still looked upon as the “baby” of the family (even though I am nearly forty) but as we have all got older we have become closer which means a lot. I do know I need a break away from podcasting for a while. I have looked at the schedules and Sina and I have come up with a plan to ensure we both get time off from recording. It won’t happen this week but it will and that will be nice. We love Star Trek but too much of anything can be a bad thing… I have also managed to increase the number of pods I listen to compared to December where I said I would cut down. I am going to cut down and listen to other things. I am waiting for two friends to get a Battlestar Galactica pod going, you know who you are! Does anyone know a good Batman pod? One that takes a serious look at the Bat, not a swearing, jokey one (although we all need that sometimes). Let me know. I had a crazy idea I would love to do a podcast all about The West Wing, there are none out there that are current. That’s a long way off though. So what’s been going on you say? 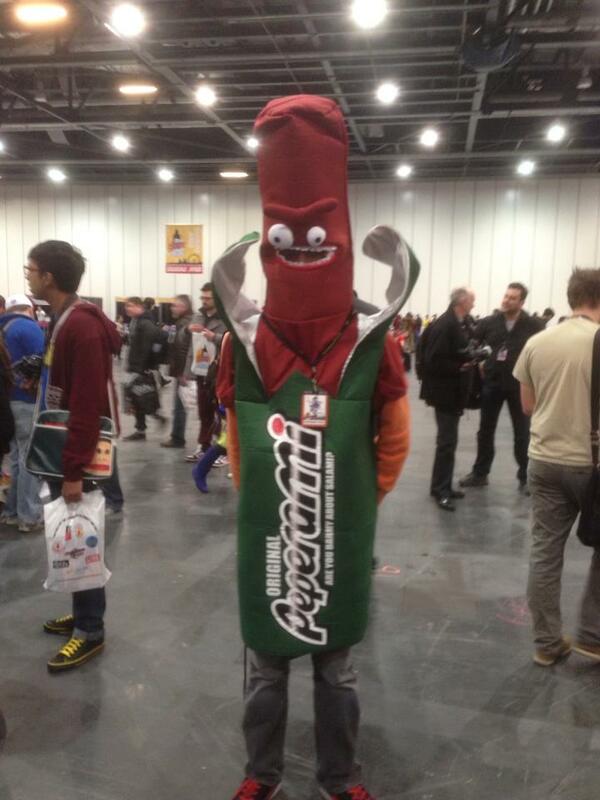 Well, I have just got back from the London Super Comic convention at the Excel in London. It only seems like a few weeks ago I was there for DSTL. I love comics! Simple as that. I grew up with comics as you know from earlier posts so to go to a convention was just great fun. I wasn’t sure what to expect and like with all things there was things I thought was great and some things that weren’t. Being in London I stayed at my mums in Finchley. Becky decided no to come for this trip so in terms of savings it made sense to stay at mums. My elder brother decided to come along so at least I was not going on my own. Now I didn’t pre-order the tickets this time so was advised to get there early, so that’ what we did. We got there before nine and was advised to join a line that would go up at ten and then I could get the tickets. To cut a long story short, that wasn’t what we should have done but we soon got in and it was time to mingle. The “Featured Creators” was the busiest area at first since everyone wanted to meet their comic idols but for me one of the most interesting areas was the artist alley. Some of this work was amazing, the attention to detail, the scale of the pictures. These people could draw! These artists were working on independent comics and I have to say it was great to see so many independent titles. The amount of comics on sale was amazing, older titles from the 60’s and 70’s, graphic novels, up to date comics. Something for everyone and you know they catered for every budget with some comics on sale for just 25p. I actually saw a Spiderman comic for £150, a number one, still in the bag! You know I have that comic and it’s in a bag.. a good investment it would seem… As well as comics there was some amazing merchandise on sale, including toys,canvas art, bags, t-shirts and even some Star Trek model kits (priced beyond reason). It was a great time looking at each stall, finding out what they were selling. Of course at every convention people like to come dressed up and this was no different. We has the Joker, Batman, Catwoman, Black Cat, Black Widow, Spiderman, Superman, Storm Troopers, Bobba Fett, Judge Dredd, some I didn’t have a clue. Some looked amazing, some left little to the imagine (the best ones) and you could tell so much was put into making these look so wonderful. It’s always great seeing the costumes and it was nice to see some Star Trek costumes too including TNG, TOS and a FC uniform. All looked great and again I have to thank these people for allowing me take some pictures. At noon the panels started and I went to the first one that was looking at the first 50 years of Marvel comics. This was a great discussion, looking back at the origins, how the films have changed how some characters are perceived in comics, what to expect for the future. There was audience questions which was great and one of the panelists explained that this was the fullest panel he has been to. Well done London. The rest of the panels did look good but to be honest I was not too keen on the topics. The one I wanted to see was on Sunday about Batman (the greatest comic character ever). If only that had been on Saturday. Now before I move on to meeting J.K. I am glad that I only brought a one day ticket (apart from missing the Batman panel). 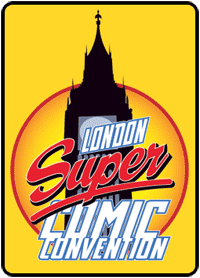 In many ways like Star Trek London there were only so many times you could walk around the venue, explore the stalls, look at the art and buy some comics. Once you have got your signings, said hello to your idols what more can you do? The panels were good but if it were me I would have had two panel rooms, had more talks from all of the guests. On the other hand for £20 you could not argue with your ticket, a goody bag, signings. I am not sure what I would have done on the second day after doing what I did on the Saturday? 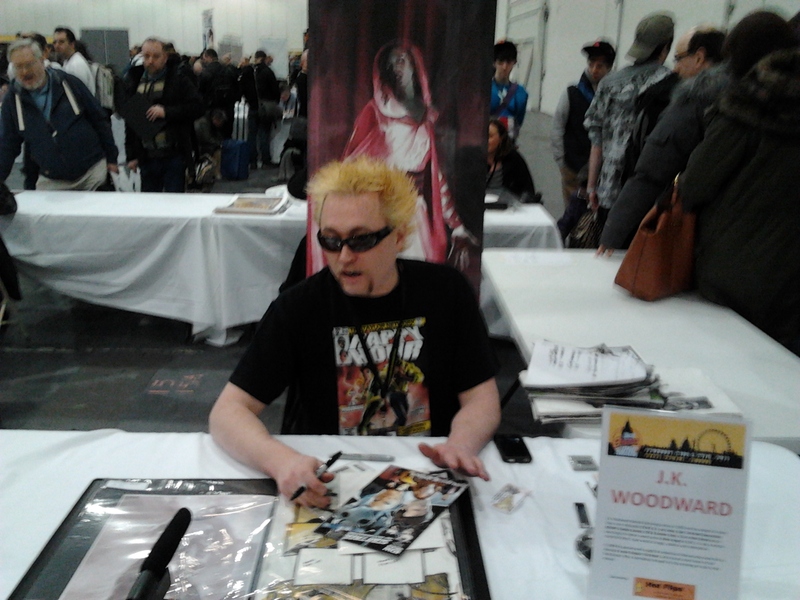 Now one of the reasons I wanted to go to the convention was to meet J.K Woodward who I have interviewed for the Holodeck, Ten Forward and who has supported me finding fellow comic artists / writers to some on the show. I was slightly nervous when I approached J.K but he was very gracious when I introduced myself, explained who I was. 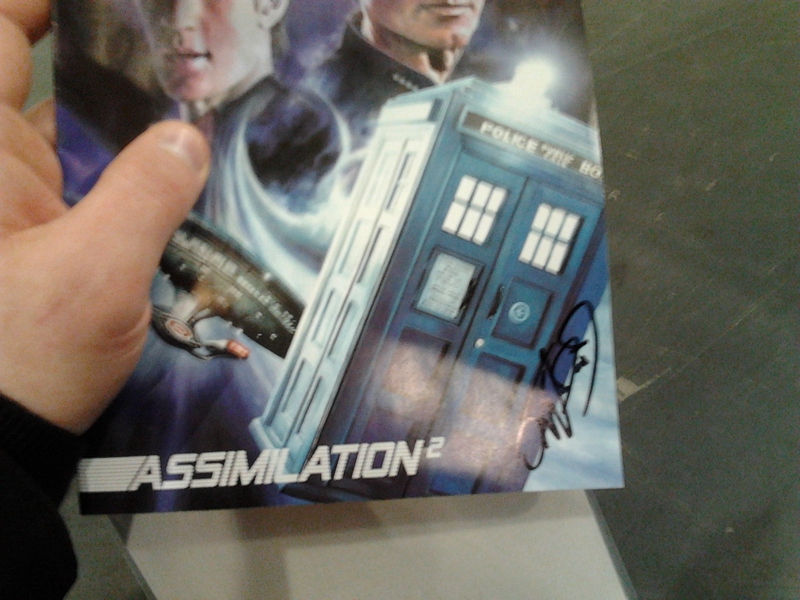 We spent some time together discussing his trip, our pods, his plans while in London and he was so kind to sign my copy of the first issue of the Star Trek / Doctor Who crossover. Something I won’t forget too quickly. It was good to see a lot of people wanting to meet J.K and find out about his work. P.S Just finised typing this and J.K has just tweeted me about having some beers! Oh for F**K sake!! I am back at my mums and can’t get back. Next time but I am not happy…. Stand Down Red Alert….it’s not diabetes….. While yesterday was a great day as I celebrated Becky’s birthday I also had to go and discover some test results from the Doctor’s. Back in January I went for my yearly check up on my heart. This year my blood pressure was higher than normal, my heart was more irregular than it normally is and I was feeling quite tired (again more than normal). It was decided by the Doctor that I needed to have more tests, take some blood and that’s when I was told it could be diabetes! Talk about a shock to the system! This hit me more than I could write or perhaps want to write. I know / knew people who have diabetes and what they have to go through to manage their conditions. Managing your weight is important and this was the much needed shock to tell me I had to lose weight and it had to be now. As you know I have written about my plans for losing weight, how I am overcoming my addiction of crisps (going well), exercise routines, and much more. After this, I began to kick start this even more. I was now at the point where I HAVE to lose weight and take care of my body. The wait between the first Doctor’s appointment and the second seemed like an eternity. Becky, as always was my “rock” and no matter what we would overcome this like so many other things. I continued with my daily life but there were some dark thoughts as the days counted down. What was ironic was that the appointment was on the same day as Becky’s birthday! The good news is that when I went in the Doctor had a smile on her face which relaxed me at once. My blood pressure has returned to normal, my blood tests have come back negative including diabetes. It seems that with all the blood tests they form a picture of the risk of a heart condition, stroke and if you score 20% or more then action would be needed. I scored 2%. There was a lot of relief. I also weighed myself and I have lost 4lb in the past two weeks. How great is that! I am now the lightest I have been in over four years. Again, something that brought smiles all round. There is still a lot of weight to lose but I am confident if I continue with what I have started then I can and will reach my goal. It’s not fair to put Becky through this or myself. Time to step back, take stock and give my body a hug. Say I am sorry for eating too much, not exercising and finally do the right thing. Just wanted to say thank you to all those who sent birthday messages via twitter, Facebook etc. Something I have always been impressed with Twitter is although we don’t meet up or perhaps don’t live in the same country we always manage to send each other birthday wishes or support in times of need. So Becky wanted to say thanks too. We had a great day visiting family, having a nice meal and just spending time together. What more could you ask for? As Faithless said in the song “I can’t get no sleep….” I have always liked that song but even more when I am struggling to sleep. Last night was much better so it should mean a few nights of sleep. I don’t remember the last time I slept all the way through the night but if I can get six hours then that’s a win for me. Sleeping aside I have had a busy week both for bookkeeping and the world of pods. I have been in contact with the school I used for my bookkeeping and we have been preparing for my soon to be exams. I feel ready but this could mean anything. Not sure how many mock exams one person can do but I know it likes overdosing on coffee! In some ways the exams are only the beginning. Then begins the work of getting the business up and running. Not the best time in the world to be setting up but it needs to be done. I have a business plan so let’s see where we go. This weekend I am recording four podcasts. One this evening with award winning writer Chris Roberson. This is for the Holodeck, Chris wrote the crossover series between Star Trek / Legion of Superheroes. Although this might sound strange the story itself is very good and is far superior to the X-Men / Star Trek crossovers. I have been planning this interview for a couple of months now so it will be great to finally talk to Chris. Tomorrow I am recording the weekly Ten Forward show. We have our special guest Chris Mitchell who will be talking about some very interesting episodes of Star Trek. Can’t say too much since it would spoil the fun but you will enjoy the show. The after the show with Chris I am recording a second interview with artist and friend of the Holodeck J.K Woodward and comic writer Scott Tipton. Both J.K and Scott Tipton worked on the epic Star Trek / Doctor Who crossover comic. We will be discussing the project, how the story was created, the art from J.K and much more. This should also be fun and will be released very soon. Finally that brings us to Sunday where I will be recording the Holodeck. This week we are recording the review of the last four issues of the Star Trek / Doctor Who crossover series. All links in to the interview with Scott and J.K. That should be fun too. Four pods is a lot of work and to be honest I have to stop doing this. Sometimes you have to schedule around what your guests can do but I need to get better at planning the shows. Becky has been very understanding but it’s not fair on her. Last Sunday I was recording until just after 1 am. I have now promised Becky that unless there is no other way I will be recording earlier and that should not happen again. Of course that doesn’t help with the sleep either. With so much on you can see the need to prepare! This week alone, I have been reading two Star Trek comics crossovers, writer bio’s and previous interviews to help me prepare questions and to try and understand the people I am interviewing. Now, don’t get me wrong I have enjoyed doing all of this. How could reading comics be a chore? I have taken part in quite a few interviews but every time one is coming up the butterflies begin, doubts begin to resurface but at least if I am prepared I am half way there. Being prepared for the interviews is important not just so that I can ask the right questions, learn more about their work but it is a common courtesy to the person being interviewed. They have given there time up so that I can talk to them and the least I can do is be prepared, know my what I am talking about. I love to be kept busy, juggling my studying with my pod work is great fun. I love to be prepared, plan the day and the accomplishment when it all comes together is very satisfying. I am looking forward to next week. Becky is off from work from Thursday for her birthday (on the same day) and doesn’t go back until the following Wednesday. A very long weekend, we have a meal planned for her birthday and then it’s out and about for the rest of the days. Studies are on hold after Wednesday and I am going to get all my pod work done by then as well. Have a great week, speak and write soon….